The ECHOMASTER reverse Sensing System is a sophisticated, ultrasonic sensing device that is designed to detect what you cannot see behind your vehicle. 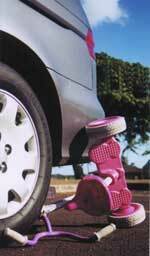 It is a sad fact that every year over 400 children are killed or injured in reversing accidents. EchoMaster’s highly efficient sensors are flush mounted in your vehicles bumper. Each time you engage reverse gear, EchoMaster’s ultrasonic technology begins scanning behind your vehicle to detect objects in your path. 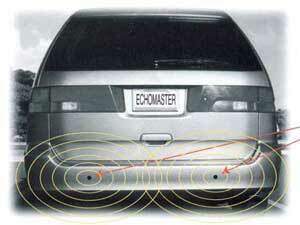 EchoMaster uses hi-tech sensors to detect objects then you are backing up. At approximately 6 feet from an object, you will hear a slow warning tone inside the vehicle. As you continue backing up, the driver tone increases in frequency as you get closer to an object. At 4 feet the frequency increases. At 2 feet it becomes a constant tone, indicating you should STOP! Proven Ultrasonic Technology. Automatically activates each time you place your vehicle in reverse. EchoMaster issues a distinct tone to alert the driver when reverse gear is selected. 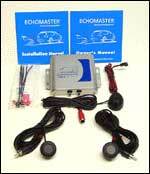 The EchoMaster CM2-Reverse Sensing System is designed to fit almost any car, truck, van or SUV. Its unique detection pattern has strong range (6′ behind the vehicle’s bumper) while giving superb peripheral coverage, ensuring you can reverse, parallel park or maneuver in tight areas with confidence. The EchoMaster CM4-Reverse Sensing System is specially designed for oversized vans, trucks, SUVs or commercial vehicles. Its unique detection pattern has strong range (6′ behind the vehicle’s bumper) from the center mounted sensors, while outer sensors ensure excellent coverage to the vehicle’s corners. The CM-4 allows you to parallel park or reverse in extremely close conditions with confidence.